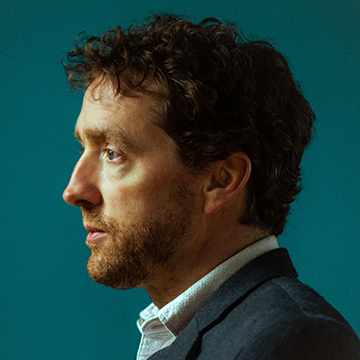 Aiken Promotions proudly present Colm Mac Con Iomaire live at Vicar Street, 18th May 2019. Tickets €28.00 on sale now. No coincidence, no story. No chance, no creation. Colm Mac Con Iomaire had gone his whole life without meeting the composer Bill Whelan until he bumped into him three times in the space of a few weeks in 2016; at the National Concert Hall, at Kylemore Abbey, and then in Clifden. Both took it as a sign. At the time, Bill had reconditioned his reel-to-reel tape machine and was looking for a new project. The stars aligned. The result is a new album The River Holds Its Breath, produced by Bill, which will be released and performed at Vicar Street in Dublin on May 18th. Colm sees this record as a collection of short stories. But it can also be considered as both journal and journey, the culmination of song gathering, commissions and creations over the last few years, during which Colm has charted out tunes like nodes on a map of a broader Irish artistic universe. There is a song inspired by paintings in the National Gallery stored in darkness but yearning for the light, a piece for the contemporary dancer Maureen Fleming, music from Colm’s score for the Oscar-nominated short film Late Afternoon, a piece for Nuala O’Connor’s documentary Keepers Of The Flame. In some ways, the record acts as a cypher through which other art can journey. A subsequent session with Colm Quearney, Bill Blackmore and Wyvern Lingo completed the picture.